The goal of the Dutch Dental Care Foundation is to provide dental care, prevention and education in Kenya, with simple means. Dental problems in developing countries are underestimated regularly. Bad oral health generally has a negative impact on the overall health condition. 98% of donation truly go to Kenya. 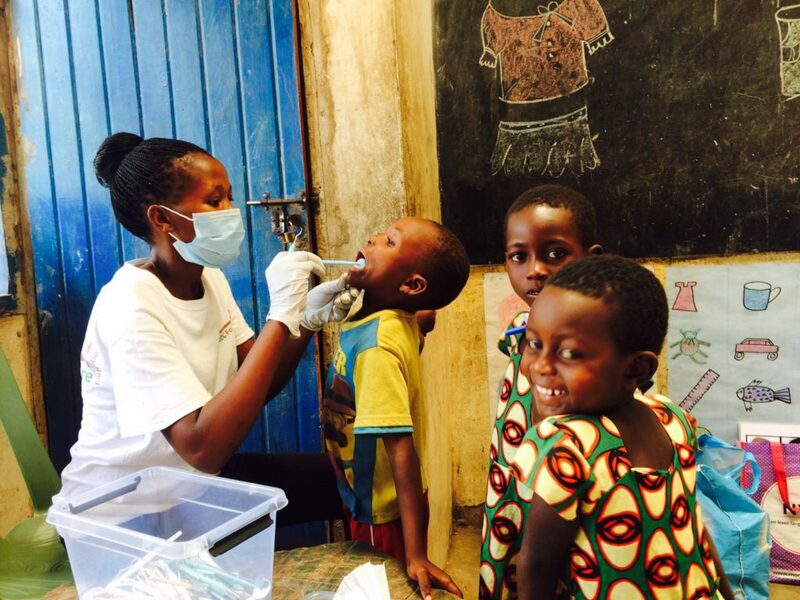 DDC uses each euro we receive in a proper and sustainable manner on oral health care in Kenya. The Dutch Tax Administration has granted the so-called ANBI-status (General Benefit Providing Organisation) to our foundation. This status means that under certain circumstances, your donations are tax deductible. To be awarded this status, our Foundation must fulfill certain criteria, for instance the fact the according to our Articles, we cannot do payments to a founder or board member. Support DDC through on-line shopping. Did you know you can support DDC whilst shopping? Go to dutchdentalcare.doelshop.nl and then you can shop on the website of your choice. If you shop through dutchdentalcare.doelshop.nl you support DDC at no extra costs. Bol.com, Mediamarkt, Wehkamp, Bijenkorf, Hema, Intertoys and many others support this. The clinic in Lunga Lunga is located in a medical dispensary. The clinic was opened in 2014 and is operated by a COHO (Winston). Everybody can get treatment for a modest fee. Throughout the year COHO informs us on the status and patients on weekly basis. Degelijk, oprecht en toegewijd hard werken. Zo ken ik het DDC bestuur en hun ondersteuning van mijn 5 jaren voorzitterschap! Ga zo door! The work you did was very important to the Menzamwenye primary school and the whole village. You diagonised our teeth without payment. For those few remarks we say thank you. I have been working with DDC since October 2016. We have been giving oral health education and treatment to school children and the society. This has made me feel proud of this foundation. May this dental work continue in Kenia. Once I working with them, I am happy... I am happy working with DDC. People from Nairobi are traveling a long distance just to come to the clinic. I am very happy they give us the motivation and we are very happy that we give the treatment to them. We are doing our best and give the services not only from people in Kwale country but far behind (Kliniek Ukunda). I am working with DDC for then years now, as a driver. I really enjoy when I am driving the group, and the DDC enjoy my driving. God bless them. Het was leuk dat we poetslessen hadden. Ik vond het poetsliedje zingen het leukste. I love this practice and I love working with DDC (Kliniek Lunga Lunga). Je vertrekt met een groep mensen die je niet kent en je komt terug met een groep vrienden. Dat maakt het werken voor DDC voor mij heel bijzonder.